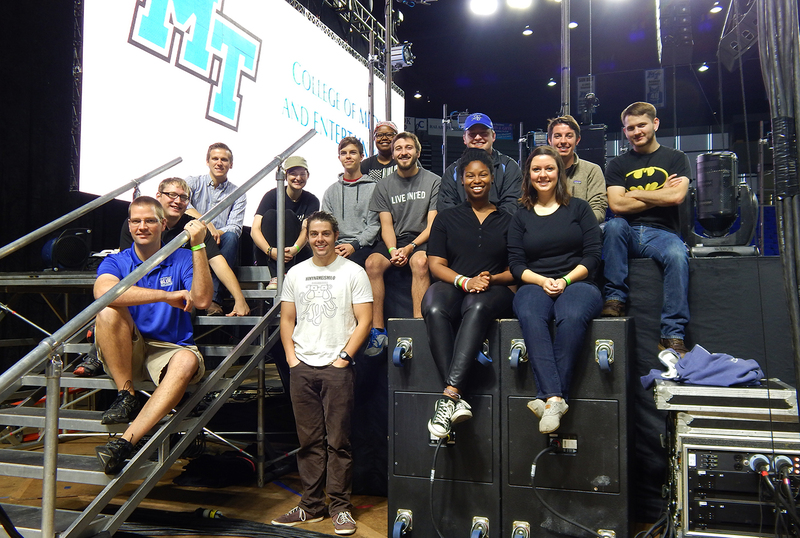 Mike Forbes, seated at front left, assistant director of technologies for MTSU’s College of Media and Entertainment, is joined by his Video Technology class students on stage in Murphy Center early Oct. 1 in front of the customized 30-foot-by-20-foot video wall they created for the Homecoming 2015 concert featuring Icona Pop. Shown on the front row with Forbes are senior electronic media communication majors Paul Douglas, Angie Carter and Adrienne Kelley. Seated on the stairs and in the second row are, from left, junior EMC majors Zack Johnson, Barrett Depies and Sara Daily; senior EMC majors David Marrow and Robbie Weaver; junior EMC major Sokoya Crockett; seniors Wes Jenkins and Trevor Ball and junior Alex Briley. (MTSU photo by News and Media RelationsHomecoming 2015 kicked off with a free concert featuring Swedish group IconaPop in Murphy Center on Oct. 1, and College of Media and Entertainment students provided a wide-range of technical support for the event. Homecoming 2015 kicked off with a free concert featuring Swedish group IconaPop in Murphy Center on Oct. 1, and College of Media and Entertainment students provided a wide-range of technical support for the event. Twelve Electronic Media Communication students from instructor Mike Forbes’s Video Technology class fashioned the layout and installed the huge LED video wall used for the event. The wall measured close to 30 feet wide. The student crew handled the content and video elements for each of the bands, then loaded up and stored the equipment after the concert. The equipment is on loan to the university through next May from VER (Video Equipment Rentals) Nashville, a leading national provider of video wall installations for the concert industry. 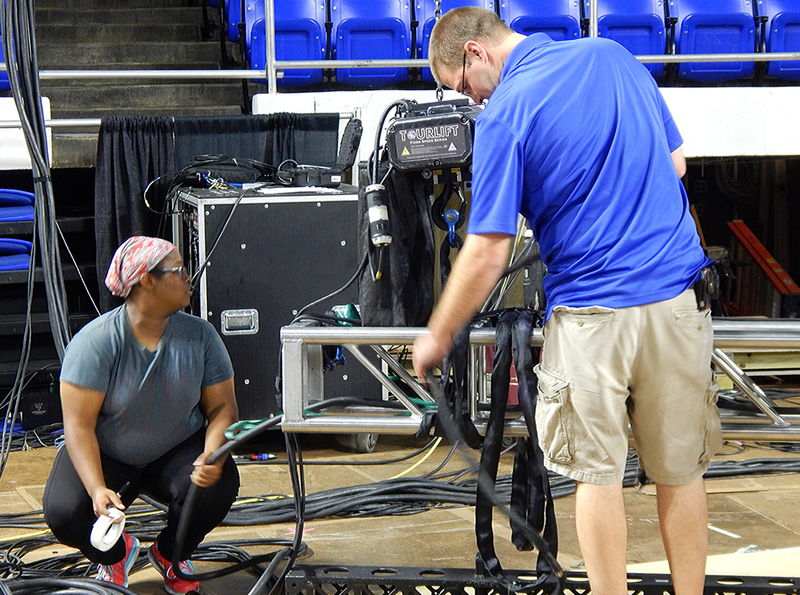 Forbes, an MTSU alumni who managed video installations for major concerts before returning to the university, said another project is in the works for this fall, and three are already planned for next spring. The Video Technology EMC class usually prepares two or three shows each semester with the LED video walls in different campus venues.